BRIAN WILSON is not the only veteran of thrilling 1960s harmony-based singing coming to the Absolut Big Top in this year’s GIAF. 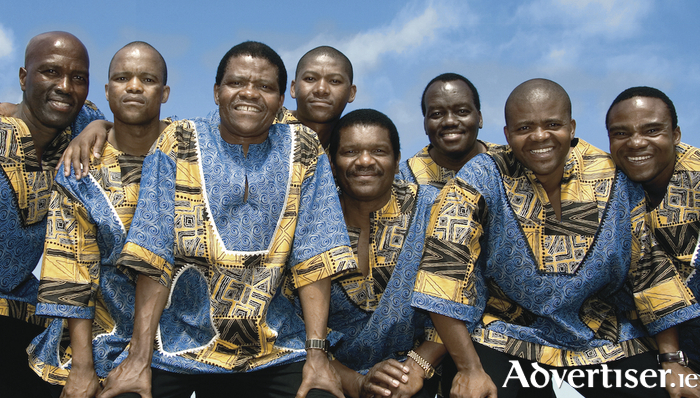 Ladysmith Black Mambazo are flying in from Durban with their world-renowned celebratory sounds of South Africa. Formed in the early 1960s by Joseph Shabalala, the group took the name Ladysmith Black Mambazo from his hometown Ladysmith, ‘Black’ referring to the ox, the strongest farm animal, and ‘Mambazo’ the Zulu word for an axe, a symbol of the group’s ability to chop down any musical rival. Initially starting out in choir contests, their harmonies were so polished that within a few years they were banned from competitions. The group draws on a traditional music called isicathamiya, which developed in the mines of South Africa, where black miners were taken to work far away from their homes and families. Poorly housed and paid, they would entertain themselves by singing. In 1986, Ladysmith Black Mambazo found worldwide fame after Paul Simon used their rich harmonies on his Graceland album. A year later, Simon produced their first international release, Shaka Zulu, which won a Grammy Award. Since then, the group has been awarded two more Grammys and been nominated 15 times. In addition to their work with Paul Simon, Ladysmith Black Mambazo have recorded with Stevie Wonder, Dolly Parton, and Emmylou Harris. Their film work includes Coming To America, A Dry White Season, Cry The Beloved Country, and Invictus. They have appeared on Broadway and have been nominated for Tony Awards and have won a Drama Desk Award. Ahead of their Galway visit, group stalwart Albert Mazibuko spoke with me about their music and I began by asking how their many collaborations have influenced their sound; “Joseph used to say that every time you are collaborating with someone it was like shaking hands,” he says. “So we would come up with something that benefited both us and the other artist. While their music abounds with joy, the group have experienced dark times, with the murders of both Joseph Shabalala’s brother and wife. “We never lost focus,” Albert tells me. The group have performed at many august occasions and before many heads of state. I ask Albert is there one special VIP gig they treasure? “The one that stands out for me was when we accompanied Nelson Mandela to receive his Nobel Peace Prize in Oslo,” he replies. “Mandela requested us to perform. We were told that they don’t allow loudspeakers only the natural voices and we said that is fine with us.